Jesse James was an outlaw in 19th-century Missouri, USA, remembered in legend as the Robin Hood of the wild west. He was murdered in 1882 by Robert Ford, a member of his own gang, for a $10,000 reward. The story revolves around Jesse james (Brad Pitt) and Bob Ford (Casey Affleck), an insecure, unpopular man who has grown up idolizing and obsessing James. Bob joins James gang during a train robbery to prove his worthiness to Jesse. The obsession is so intense that Bob wants to murder Jesse and take his place finally as he believes that he is better than his ideal. Towards the end of the movie Bob shoots Jesse in the back of his head while he was dusting a painting of a horse. After the assasination the Ford brothers become celebrities, but Charley is guilt-stricken and eventually commits suicide in 1884. Bob too suffer from the pangs of guilt and is considered a traitor in public opinion and eventually is murdered by Edward O’Kelley, who later got pardoned for avenging the death of Jesse James. 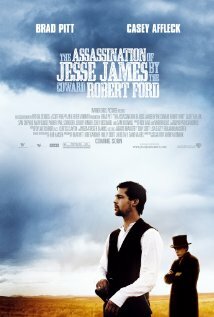 The style of the movie is solemn and remote and hictorically as accurate as all available sources on Jesse James. This superbly researched and brilliantly cinematographed psychoanalytical historical epic is my ‘Movie of the day’.